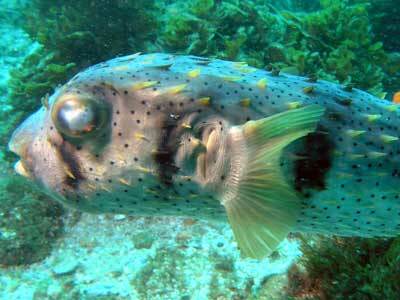 While Byron Bay has a number of dive locations, nowadays only Julian Rocks is regularly dived. Some of the locations are no longer dived at all (eg The Pinnacle). Julian Rocks is a small island composed of four large rocks of varying size that are basically joined into one large rock and which run from north-east (smallest) to south-west (largest). It is located about three kilometres north of Cape Byron. 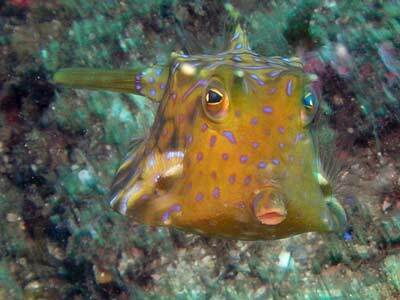 Julian Rocks is a great dive location, with a number of dive sites around the rocks. The most dived site at Julian Rocks is The Nursery. This is about halfway along the north-western side of the island. It is a shallow dive, used a lot because probably 95% of the divers who visit here are very inexperienced backpackers and because it is also the most protected dive site when southerly winds and seas are prevailing. It is only a few minutes run from The Pass beach launching site to Julian Rocks. There are a number of moorings here, so which one that is used will depend on which one is free when you get there. Note that you cannot launch private boats at Byron Bay and you can only dive by using one of the local dive shops unless you run out from Brunswick Heads which is at least 10 kilometres away. I will describe this dive from using the mooring called The Anchor. At the bottom of this mooring and a short distance to the east there is a huge Admiralty anchor. This has a long section of chain that runs off to the north-west for some distance. 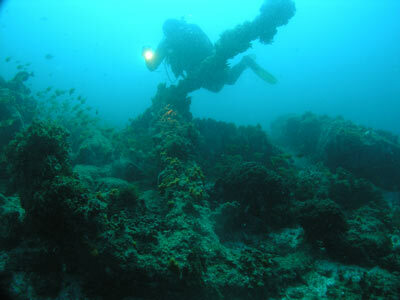 The anchor is a very good photographic opportunity and when visibility is good, you can get some nice shots. A dive would normally head off in a westerly direction till you hit the sand. The depth at the bottom of the mooring is about 10 metres and it deepens till about 12 metres on the sand edge. Dives here seem to not stray too far from the mooring, probably because most of the divers are very inexperienced and the high likelihood that one of the group will run out of air. The bottom is composed of a rocky bottom with some small rock outcrops with some sand in between. The last time I dived here the bottom was totally covered with wobbegong sharks. 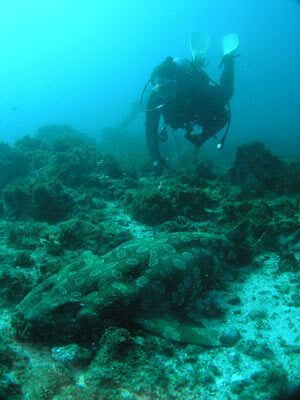 Some of these were normal wobbegongs but there were many of the newly identified dwarf wobbegong species. I have never seen so many wobbegongs, even back in the early 1990s when they covered wrecks like the SS Tuggerah in Sydney. Keep an eye out while diving for yellowtail kingfish, jewfish, large snapper and giant trevally swimming high up in the water column. On dives in this area were saw some huge snapper and kingfish. 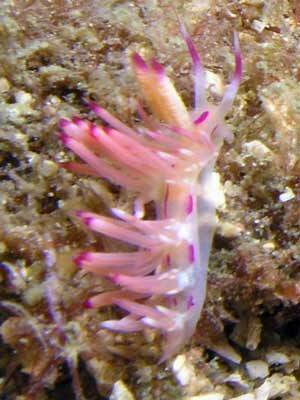 On the bottom, look for anemones and in most you will find clownfish. There are not the huge numbers that are seen at North Solitary Island, but you will see some small ones. 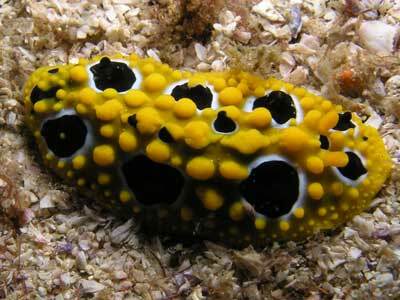 There are also a lot of interesting nudibranchs to be seen as well as a number of species of starfish. One thing that we found was that nearly all of one species were mutilated. These were either single arms, single arms with smaller new arms regrowing or part starfish with one or more arms missing. What is eating them? There are also eagle rays, large bull rays, turtles and more to be seen. After swimming along the sand edge to the north-east for a while (you may get to 15 metres or so), you can cut across to the east and in the shallower depths. This is also where you might find turtles. You probably may have more time so you can circle back around and spend some more time exploring before starting your ascent. Visibility here can be very good, with 25 metres being not uncommon. However, it can also get quite poor due to the outflow from the Tweed and Brunswick Rivers to the north and the Richmond River to the south. Water temperature ranges from at least 25ºC in Summer to 18ºC in Winter. Note that bottom times are severely limited by the dive shops, with 45 minutes being the maximum bottom time permitted, no matter where you dive. 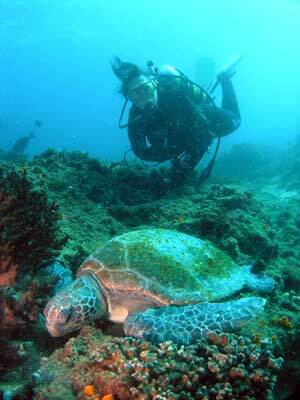 All visiting divers must be accompanied by a dive guide, no matter your experience. 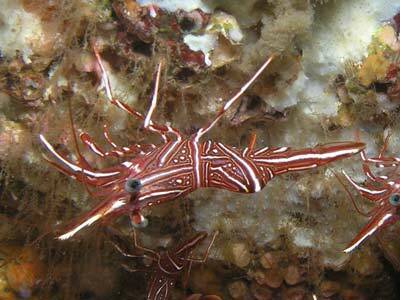 The dive guides generally appear to have little experience and some perhaps less dives in total than I have done in the preceding six months. On the first dive of my last trip here we were led around in circles, never getting more than about 40 metres from the mooring.